December 15, 2013 November 2, 2014 thinkingreallymattersLeave a Comment on Will the inmates be still running some asylum? Will the inmates be still running some asylum? Generally, The Inmates Are Running the Asylum does have some valuable insights, especially, when written more than 10 years ago. Alan Cooper predicted Apple’s success during its under-performing stage from Apple’s principle of design being fist. It turned out to be true several years later with iPod, iPhone and iPad dominating the market. However, the book is a little bit long-winded and the same thing is repeated again and again; on the other hand, repeat is an important design technique. Simply speaking, it’s a book to persuade or guide Interaction Designer to back in the driver’s seat; and focus of interaction design is on users rather than functionalities. My favourite part is Part IV which is more practical. You may check my reading note summary in the end. However, reading from the book cannot shed any light on the question lingering in my mind these days. Why for business system, we still use go-to-hell interfaces? Business system here I mean core corporate systems for large company, like SAP ERP. We have to try so hard as to figure a way out in the functionality forest. Sometimes, even creating a sales order or re-printing an invoice is torturing for end-users. Running the same reasoning from the book, the conclusion I get is again, usability is not the highest priority for business system. Employees are paid to use these complex business systems. Only when labor cost is going high enough and the go-to-hell interfaces really jeopardize business operation, good usability may have more saying and higher ranking. Will the inmates be still running some asylum for corporate? Am I missing anything here? Maybe I am wrong. I do hope I am wrong. 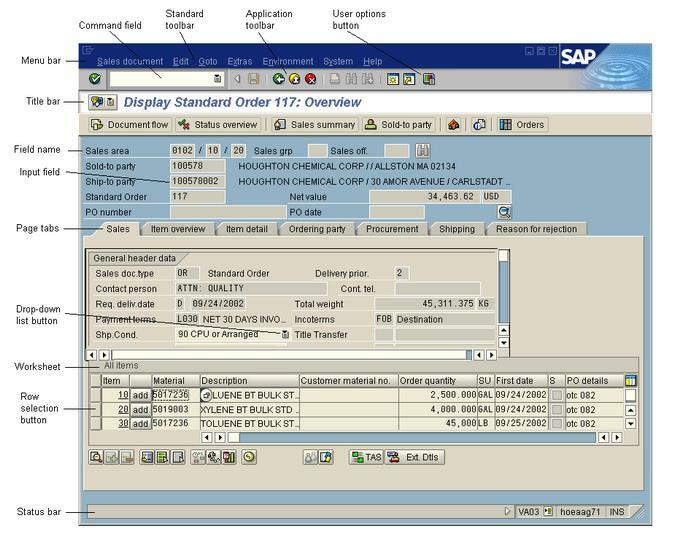 Last but not least, below picture is a classic SAP ERP system screen, it take ages for end-user, even to re-print the order after changing any text. I am not saying the system is bad. SAP is great company and SAP ERP is a great system. SAP ERP is originated from old version years back and usability was not a focus over its early age. It’s just difficult for me to adjust even myself from iphone to it day in and day out. Product design should not be “pro bono” task of programmers. One of programmers’ main jobs is to make sure every aspect and every single scenario is under control; but the downside of over-controlling is complexity. Besides, daily-use scenario and edge-case scenario have the same weight from coding point of view. Therefore, the most possible consequence with programmer handling design would be a product full of fantastic feature list, but a product nobody can use easily except the programmers themselves. 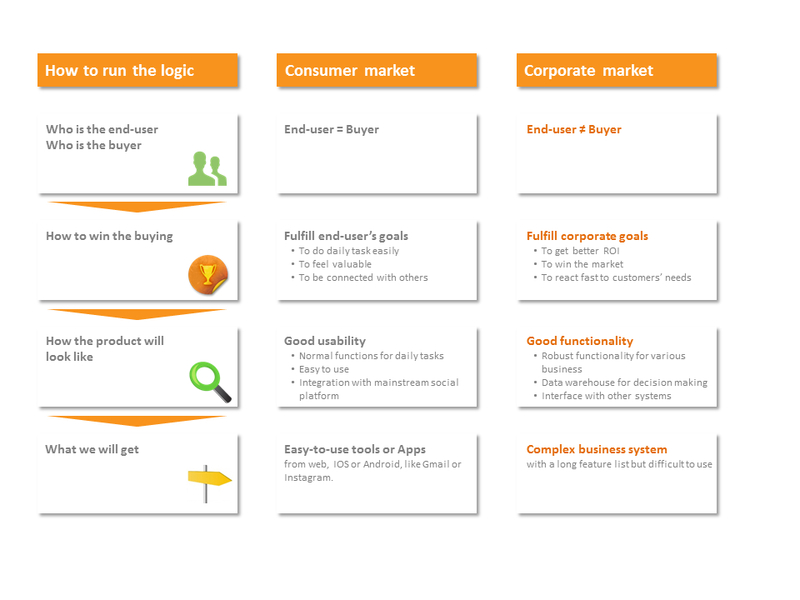 IT product is to let users achieve their practical goals without violating their personal goals. Not make mistake; or even a mistake is made, there is a simple way to correct it. It’s goal-directed design, not task-directed design. Tasks changes with technologies advancing, goal remains the same. Common trap for programmers’ design is task-directed design. Define the person in great and specific details rather than that the person be the precisely correct one. We provide all the scenarios, but we need to design only for those that are important or that will occur frequently. Focus on daily-use scenario and support necessary-use scenario.